I’m at the dinner table in a hotel and the people I’m with are chatting about their husbands and families; reflecting on how things might be going back home whilst they are away. My workmate is describing how her husband will hang washing out, but refuse to put it away, and so piles of clean clothes amass around the house. Another colleague is laughing at her husband’s inability to properly load the dishwasher, and how often she ends up re-loading it after he has cleared away after dinner. I smile and laugh along, but under the table I am digging my nails in my hands and trying not to cry; biting my lip and glancing around the restaurant to wait for the emotion to pass. For someone who used to cry maybe once or twice a year, I have perfected the art of only ‘just about’ avoiding crying in public over the last few weeks (as well as several very much failed attempts at avoiding it). The thing is – I want so badly to have my own, current tales of domestic monotony to share at dinner but I have none. In the end, the things you miss are not the big things, they are the small things. Chatting about your day in the kitchen whilst you wash up, going through your list in the supermarket and discussing what you might have for dinner, rifling through the washing basket and washing the things you know they’ll want to wear the following day. I took all of these things for granted and now all I want is normality, to fit in with what I feel most 32-year-old’s lives look like, and what I always wanted mine to look like at this age. I imagine a parallel universe where I will be leaving the hotel and going back to cook dinner, put children to bed and go to sleep in a home in a leafy suburb, instead of going back to unpack my bag in the back bedroom of my parents’ house. How can I have messed up so significantly that this is my life now, instead of that one? I always thought that I was ambitious; a dreamer, someone who shot for the stars, but what I long for now is just normality and familiarity. I don’t want a six figure salary or a wardrobe full of designer handbags or a round the world plane ticket (well, maybe that one), I just want Netflix and a takeaway pizza under a blanket with someone I love. Over the last few weeks I have been trying to ‘get on with things’ – work hard, see friends, carry on living even though I feel broken inside. But in the last few days the wheels have stopped turning and the cracks have made their way to the outside. I just can’t do it any more. I can’t hold back the tears, the tide of emotion, the feelings of sadness that sit like a permanent lump in my throat. I have had to wave the white flag and admit that, put simply, I am not okay. I have been struck by how many people haven’t asked how I am; friends who haven’t been in contact; people who don’t seem to express much concern at someone explaining that they no longer live in the house that they owned with the person they were married to. But I realise now that if you look like you’re okay on the outside, people assume you are okay on the inside (and I get that people are nervous to ask and think you might not want to talk about it, which is sometimes true). It has taken a lot (for someone who prides themselves on being rational, measured and strong) to admit that I need help and support. I lay in bed yesterday morning and messaged friends to explain how I was feeling, and not one person made me feel unreasonable, or weak or as if I shouldn’t be feeling like this. 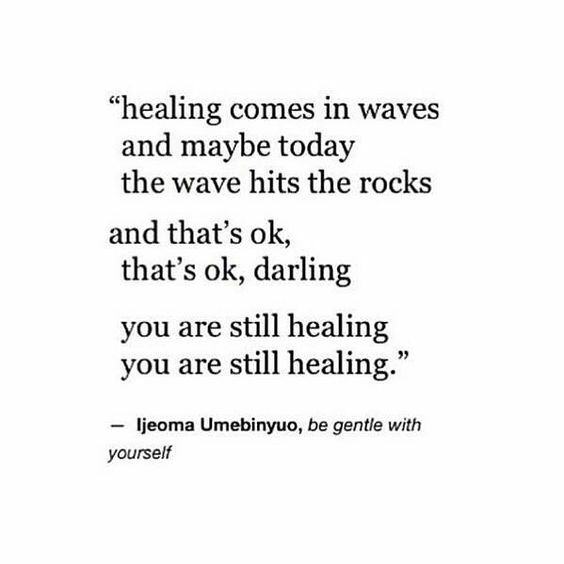 I messaged my boss and she has helped me find space in my work life to allow me to heal and recover. I allowed people to help me and to offer advice and send love. All of a sudden, bottling it all up doesn’t seem that sensible any more. I’ve never been sure whether to share these things on here, for fear of looking like a ‘whinger’, or an ‘oversharer’. Blogging (and particularly social media) often feels as if it should be about the best bits, and all I seem to share lately are the worst bits. But it feels important at this time to open up about the darker days in the hope that others feel less alone when days like these arrive for you also. I have been angry with myself for not being able to cope – for days when my brain won’t seem to work and I forget things, for days when even just driving home from work seems complicated and tiring, for days when my brain just replays images over and over until I cannot bear it any more and have to numb it with sleep/wine/giant bars of chocolate and other vices. What I have learned is to show myself kindness and allow these days to happen, knowing that there are brighter days around the corner. As my friend said, ‘these days, or weeks, or months are just a dropped stitch in the tapestry of life’. Here’s to just the hope of more colourful, well rooted stitches that are a little further along the pattern. When glimpses of hope arrive, they must be clung to.